You are here: Home / FAQ's, Acronym’s, & Terminology / FAQ on Duct Cleaning: All Hype or Worthy Expense? 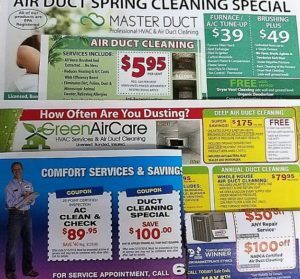 It must be spring time… I got the following in the mail just the other day: 5 different ads all for duct cleaning. With allergy season starting along with my favorite ad asking just “How often are you dusting?” one has to wonder, is it worth it? Along those lines, looking at the pricing and descriptions one has to go, just what is the best option if it is worth it? Duct cleaning can vary from company to company and even different offerings in the same company. That is one reason why one should ask what they are proposing as some are simply pop off register covers, vacuum them along with reachable areas of the duct which you can easily do yourself with a shop-vac. A true duct cleaning should include all components of the HVAC system, from the coils, the registers, the ducts, etc… This generally involves putting the whole system under a negative pressure via a vacuum while using some sort of agitation device to break the dirt loose – brushes, balls, robots… Some may include a mildewcide, sealer or something similar which is something to ask about if you have someone with respiratory issues. Solves the Dusty House Issue? While dust comes from many sources, it can be duct related. The catch; cleaning them is only masking the issue on a short term basis. The real issue is generally tied into just how leaky are your ducts, especially on the return side. You want to solve the dustiness issue, find and fix the source of the problem & then you might consider cleaning them. Caveat – if you are going the Aero-Seal route, check to see if they want them cleaned before hand & you can skip doing it afterwards as the adhesive has locked everything in place. Can it make things worse? The other issue is you can actually make things worse by disturbing the dust in your ducts — huh, say what? Well this gets into fluid dynamics and how air moves through the system. In layman terms, dust that has settled in the system tends to stay settled in those areas. Why because air doesn’t flow through perfectly even, some areas are calm while others are turbulent. By disturbing it now, it will have to find an area to resettle, whether it is still in the system or on your nick-knacks it could take a few cycles of your system for that to happen. Does my ducting type matter? This question generally comes up for those that have flex duct & the answer is that a well equipped company can safely clean any type of duct properly installed that isn’t damaged. As for getting access to some, well that is a different story. Flex: With that said if your flex duct is bunched up, has hard bends they are going to have issues & it won’t get “clean.” If it is torn it could easily get worse. Fiberglass: Some ducts are made of fiberglass which can release fibers. 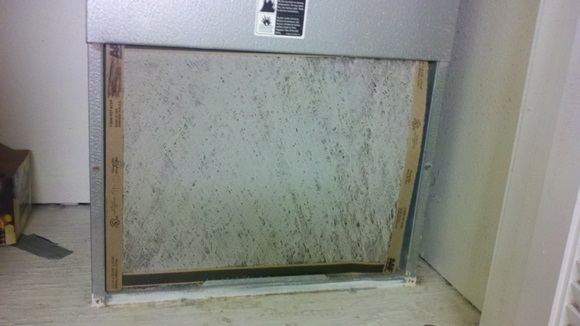 One other big issue is if they have mold, mildew, smell, etc… there is no safe way to clean them & they need to be replaced. Cardboard (Under Slab): I would recommend they scope it first – as your chances of parts being exposed directly to earth are high. Transitions: These areas can be hard to get cleaned – for example, as you go from round to oval to square. This is one reason that many companies have to cut into the main lines. Construction: While one should have the unit shutoff or rooms that are being worked on having the registers sealed it doesn’t always happen that way. In some cases you might be fine, but if there was a lot of sawdust or drywall dust that got into the system it can clog things up / create a food source for mold if there is a water event or one has an integrated humidifier. In short, duct cleaning is generally not worth the expense with the few caveats listed above. Got allergies, while the duct system can pass allergens through one should eliminate the path that said allergens got into the system before even considering a cleaning. Those “cheap” cleanings is something you can do yourself, pop the registers & vacuum them & the reachable duct. Make sure you have your unit checked at least every other year which includes a coil & pan cleaning (More often if you have an integrated humidifier) One item most throw in for free is probably the most important item they offer – don’t forget about your dryer exhaust.